Kindle on Amazon! What you get: The Kindle version of Lenders I (3rd Edition), has EVERYTHING, including these 4 bonus chapters! Paperback from Amazon! What you get: The Paperback of Lenders I (4th edition). Same as the 3rd Edition noted above, minus the 4 BONUS chapters. INCLUDED: 600+ pages that’ll have you laughing, exhilarated, and crying! If you must have a paper version, this is for you. Want the bonus chapters? Be sure to pick up the Kindle version too. Proofreading services provided by THE MAN, master “Word Refiner” Mark Schultz. SMASHWORDS! What you get: The Smashwords version of Lenders I (3rd Edition), has EVERYTHING the Kindle version has! Kindle. 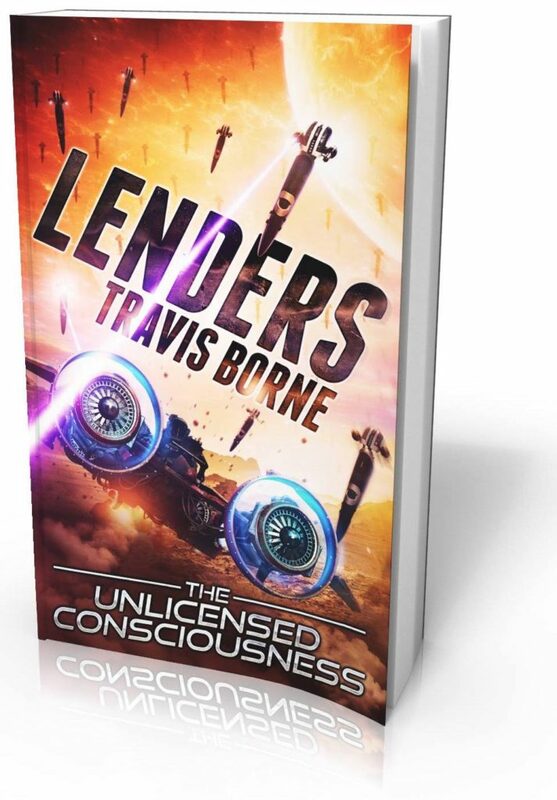 What you get: The Kindle version of Lenders II (1st Edition), has EVERYTHING! Proofreading services provided by THE MAN, master “Word Refiner” Mark Schultz. Paperback. 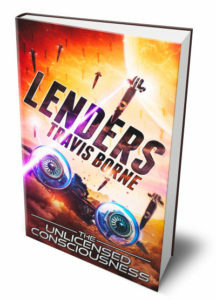 What you get: The Paperback of Lenders II. Same as above, has everything. 600+ pages that’ll have you laughing, exhilarated and crying! Lenders II will take you where you’ve never gone before. SMASHWORDS! 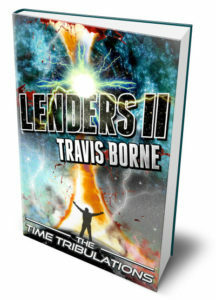 What you get: The Smashwords version of Lenders II (1st Edition), has EVERYTHING the Kindle version has! 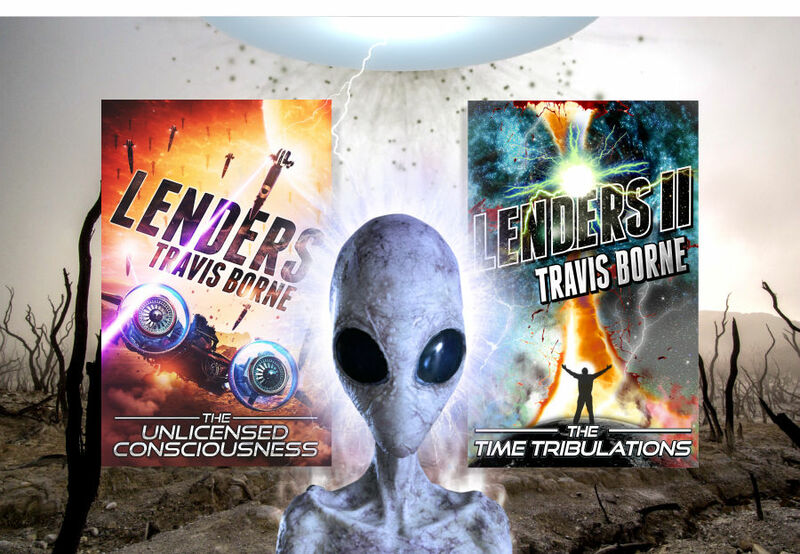 & NEW for 2019 Travis Borne “First Sci-Fi Saturday” interview by Author Tegon Magus! Follow Travis on Facebook | Twitter | Smashwords | BookBub | Google+ | YouTube | Instagram | LinkedIn | LENDERS FB Fan Page! Want to boost your brand? Trust me, try this! If you like sci-fi, if you enjoy works about a post-apocalyptic future, if you make jokes about robot overlords, this large-scale techno-thriller is for you! Nearly 450K words of adventure. 1,400 pages, Lenders I and II. 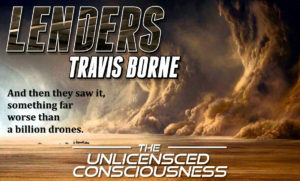 The Unlicensed Consciousness, and The Time Tribulations! Amy had devised a plan yesterday while thinking all day about how on earth she could possibly do it. In the past… Alone in vision, but not in mission. Will Herald and his team succeed where most civilizations of the Universe fail? In the future… Can Amy and Jim slip through where all others have failed? Can Amy and Jim slip through where all others have failed? Will a species prove itself worthy? Will a beacon for assistance be answered, and if so… will it arrive in time? Chapter 105, Lenders 1: The Storm.